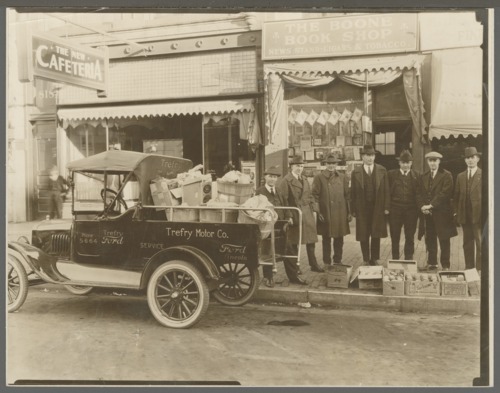 This photograph shows the first charity Christmas drive of Topeka's Chapter #5 Disabled American Veterans group of World War I. The men have been identified from left to right as: John Doane, Arthur Henry, William H. Trefry, Terrill, George Jacques, Ed Hanlon, and Paul R. Parrish. The businesses in the background are the Boone Book Shop and the New Cafeteria. The Ford truck used to collect the donations was provided by Trefry Motor Company.